Boot from LAN is really useful if you have lots of computers. This article will guide you how to install OS through Network boot. Since the early versions of AIO Boot, this tool has supported booting from the LAN. It supports you to do a lot of work such as installing OS, running tools to Ghost, managing partitions, backup and recovery. You just need a computer to replace the other bootable devices like USB, HDD and DVD… Of course, clients need to have a local area network connection with the server and have network boot support. If you boot from USB, boot loader and operating systems will use the files on USB. If you boot from the LAN, the boot loader and operating systems will download the necessary files from the LAN. The advantage of network booting is that you will not need to attach boot devices to clients (except cables). If the data transfer rate in your LAN is slower than the read/write speed of boot devices such as USB, HDD or DVD, the speed is the downside of this method. AIO Boot supports Windows installation from network boot. You can install Windows by integrating ISO and using the Windows Installer or booting into WinPE and installing Windows manually. Most Linux distributions like Ubuntu, Debian, Linux Mint, Arch Linux are also supported. To boot from LAN, you need to have a PXE server, a DHCP server, and a server to share files. You just need a computer to do all this. AIO Boot uses Tiny PXE Server to create PXE server and DHCP server. Run AIOCreator.exe, select Run PXE and select mode to run Tiny PXE Server. AIO Boot uses iPXE as boot loader, which supports both legacy BIOS and UEFI (32-bit and 64-bit) modes. Tiny PXE Server will run and be preconfigured. If the configuration is not correct, reconfigure it. Option 54 (DHCP Server): The IP address of the computer running Tiny PXE Server. This list contains the IP addresses of network adapters (including VirtualBox and VMware). You need to select the correct IP address in the same local area network of the clients. Filename: Boot file of iPXE, you can choose another boot file in the /AIO folder if the current file does not work on the client. Legacy: undionly.kpxe, undionly.kkpxe, ipxe.pxe and intel.pxe. UEFI 64-bit: ipxe64.efi, snponly64.efi and intel64.efi. 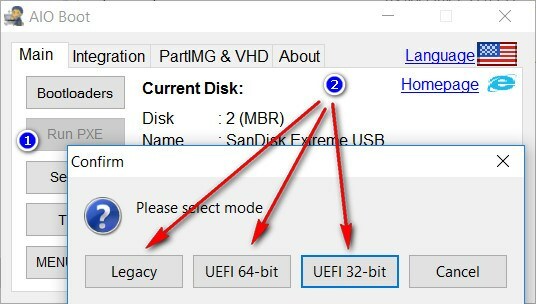 UEFI 32-bit: ipxe32.efi, snponly32.efi and intel32.efi. After reconfiguring, click the Offline and Online buttons for the changes to take effect. For Linux distributions like Ubuntu, Debian, I use FreeNFS to create NFS servers. You do not need any further configuration. If the files you need are already on the client, just use it. But if the files are not on the client computer, of course you need to get it from another computer. You can download it from the Internet but the speed will be much slower than the local area network. First, copy all the necessary files to a folder and then share it. Or share a drive. See the Guide to Share a Folder or Drive from Microsoft. Right-click on the AIO Boot drive and select Properties. Enter a name for the Share name. The Network Path is what I need to get, here is \\Whoami\g. Run AIOCreator.exe and integrate Windows ISO file into AIO Boot. Only support Windows 7, 8, 8.1, Windows 10, does not support Windows XP. Run PXE and boot into PXE on clients. This is the iPXE menu of AIO Boot. 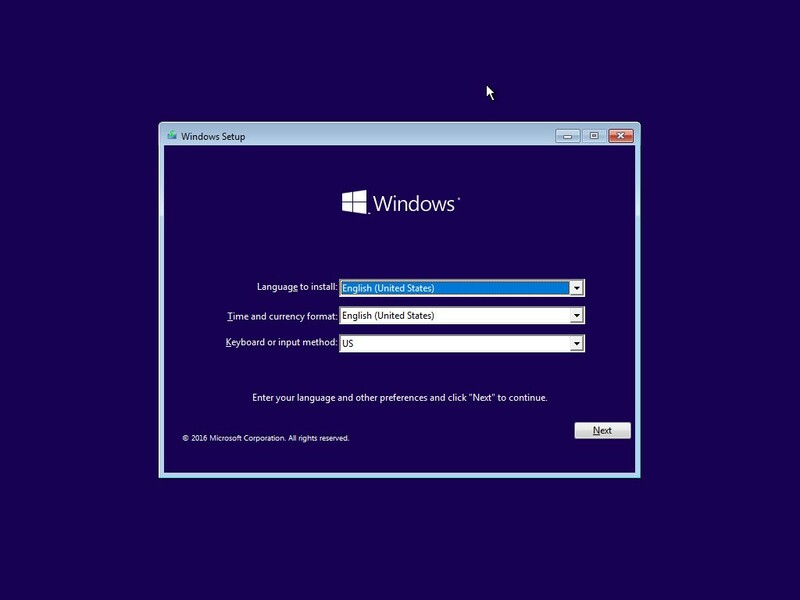 Access the WinPE & Setup menu and boot into the Windows menu that you integrated in step 1. Enter the Network Path you shared in step 2 when asked. You can enter Network Path|Username|Password if the server has Username and Password. For Windows 8, 8.1, and Windows 10, if you use a Microsoft account to sign in, it is also your computer’s username and password. Enter the username and password that you used to share the AIO Boot drive. Or you can Turn off password protected sharing. The password is not displayed when you type it at the password prompt. If the information is correct, the Windows Installer will appear. You can then install Windows from Network boot using the same steps as using a USB or DVD. Windows 7 may not support your network drivers. Try Windows 10 or Windows 8.1. Connection blocked by Firewall, try disabling it. My connection is blocked by Bitdefender, I disabled the firewall in Bitdefender and everything works. If you only use a single computer to initialize the PXE server, you only need to enter the Network Path once. AIO Boot v0.9.8.7 supports reading Network Path from /AIO/networkpath.txt. Just add the Network Path to this file, you can add multiple Network Paths by adding multiple lines. The tool will try one by one. If your computer has an account and password, add them behind the Network Path separated by a vertical bar (“|”). If you then initialize the PXE server on another computer, this means that the Network Path, user name, and password have changed. Just enter the new information in /AIO/networkpath.txt. The above steps will help you to install Windows easily. There is another method that you can use for many other purposes. That’s using WinPE. See instructions for installing Windows from WinPE for more details. Download WinPE and integrate it into the AIO Boot as instructed in the Readme.txt file. Boot into WinPE from network boot. 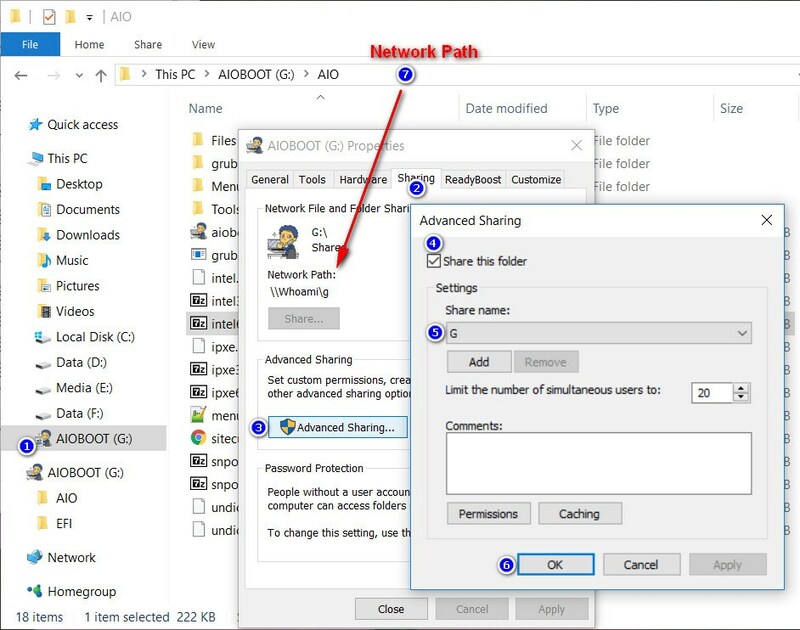 Use the net use command to connect to the drive or folder you have shared. Here I will attach the Network Path to the Z: drive. AIO Boot also supports booting and installing many Linux distributions such as Ubuntu, Debian, Linux Mint, CentOS, Arch Linux… Just run AIOCreator.exe and integrate the Linux distributions. Then boot from the LAN, it will appear in the iPXE menu if it is supported. If you do not have computers for testing, you can test this feature through VMware Workstation. Wish success! We are getting issue in to net boot porteus os using AIO . So please help me out to resolve issue. Hello, where AIOcreator.exe can be found. 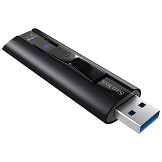 In downloads there only is AIO_boot_extractor for usb drives, which i dont need. I need the AIOcreator for PXE boot. Thanks. Okay nvm, i just used one of my commonly unused abilities – I read installation instructions.Sorry and thanks. If you are stuck at the splash screen. I found a fix, maybe not for everyone. If loading linux, you have to change the bootloader to syslinux. I need some help here, I was trying to boot the windows 10 ISO. I followed all the steps above, integrated the ISO well. After booting from the PXE on a client machine, selecting “WinPE & Setup” -> then selecting the Windows 10 menu, I can see that boot.wim has processed from the WinSetup folder and then nothing happens. blank screen with a white cursor on top left. What am I missing? I have also shared the AIOBOOT drive properly. tried, nothing happens – same as before. finishes the boot.wim loading from WinSetup folder, and then nothing happens. But you didn’t mention FreeNFS and how it works with your AIO Boot! I have mentioned FreeNFS in this article as well as in the home page. I couldn’t get my laptop to boot from USB–something wrong with my key, and I have no cbrom drive. This tool allowed me to get windows installed on my laptop. It was pretty easy! Thanks a lot for creating this. Thanks for your tool but I ended up using Serva. I’m using Legacy Mode with a Windows 10 iso that is unattended. After I pick the ISO in Grub2 I get a underscore blinking to infinity… Any help would be great! 11:14:23 HTTPd:Exception: , Connection Closed Gracefully. I’m having trouble booting into a Linux live CD with iPXE, specifically Debian 7 XFCE. It boots to a login screen. Some searching has told me that it needs to be configured to boot in live or single user mode, but I haven’t been able to change that configuration. Any idea why Debian 7 live would boot to a login screen over the network as opposed to the regular live installation desktop? There’s no user/password combination that works, so I’m stuck there. I’ve looked at the .cfg file that gets made when integrating the .iso file, specifically that it has boot=live, but don’t know what could be wrong there. Send me the download link ISO file, I will try it. Have you tried out newer versions of Debian? I’ve also tried the normal Debian 7 XFCE ISO, and it behaves the same way. I did try newer versions of Debian, but it’s an older computer and it didn’t make it all the way through the OS bootup. Sorry to bother again — were you able to test this ISO out? Sorry, I forgot to test it. Thanks for the help! That worked. 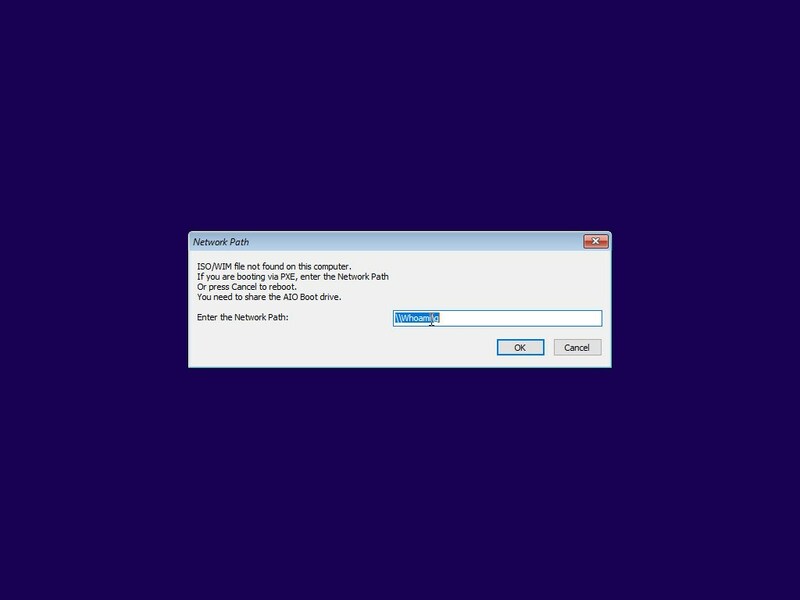 i am trying to install windows 7 64 bit using PXE but when i get to part where i am supposed to insert the network path it gives me an error and asks me to add the netowrk path again, only work for windows 10 from your post and i quote “Windows 7 may not support your network drivers.”, is there a way to solve this problem? Sorry but I have no solution to this. Thank you for updating so quickly. When I enter the path manually when the dialog pops up, it works just fine – so there shouldn’t be anything wrong with the share setup. I’ve tried with both Windows 7 and Windows 10 installs. Please tell me if there is any more information I can provide to you that will help. Oh, wait… do I have to do the integration process again for it to work, or should it work with existing setups? I’ve not tried integrating it again, but I will do in a moment. Yep, just had to do the integration process over again, works like a charm now. Thanks! Daniel , did you had to do this over an IP ? or the server name ? did you use a space after the sharename ? i cannot make this working, and just wonder how did you made it work. 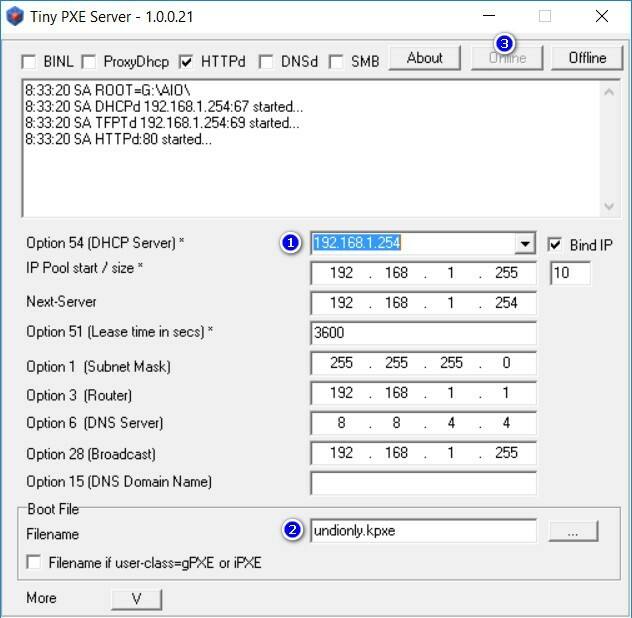 I am able to use both IP and computer name, BUT – I did not get it to wori by using TinyPXE server as DHCP. I set up another DHCP server using a Pfsense virtual machine and then Proxydhcp enabled in Tiny PXE server. That works every time. If you don’t want to use pfsense you can also use an old router or Windows-based DHCP server software. Just make sure to enable proxydhcp once the dhcp server is set up. This may not be true for everyone, but that is the only way I’ve been able to get it working 100%. Then I just tried “\\PC-name” and voa lá, found. You need to re-integrate with version 0.9.8.7. Then you just need to change the Network Paths without having to re-integrate them. Thank you. Yep, got it working after re-integrating. Another question though, although I am not sure this is within your control. When booting certain WinPE-based images over PXE, I’m getting a 0xc0000017 error saying “There isn’t enough memory available to create a ramdisk device”. This happens on a Lenovo Thinkpad W530 with 32GB RAM. The same image – Bob Ombs WinPE – works fine in a Virtualbox VM booting over PXE with only 4GB of RAM. I guess wimboot is to blame? thx for your comments! I was able to get windows 10 installed as well using ur comments! This is excellent. I am just wondering – is there a way to “hardcode” the network path? I use Aioboot on a dedicated machine, and the network path never changes. It is somewhat tiresome to enter the same network path, username and password over and over again. Is there somewhere I can write this stuff in so that it automatically connects to the share? This is regarding the Windows installation process, btw. Okay, I will add this feature in the next version. Thank you, looking forward to it. May I ask what the name of the application that executes the “Network path”-dialog is? Maybe I can create a temporary solution. \AIO\Tools\winsetup\Lmsify64.exe, this is the program I write to handle mounting ISO files. Excellent. Thank you very much for your help today, Tu. Have a good day. Hi again. version 0.9.7 has been really nice, but I have encountered a few issues regarding auto mounting Windows install share. From what I can see in the Tiny PXE server log and other logs, it seems like the installprogram doesnt ask for an IP address until after the lmsify program tries to mount the share. The auto mounting program seems to be “too quick” 😉 So it usually works great, but sometimes it will fail and bring up the “Network Path” dialog, even though the share is up and running. Windows Share does not depend on Tiny PXE Server, because it can operate without Tiny PXE Server. Lmbify only performs the connection after the network service is ready. I’m not sure it will work if the connection is delayed for a few seconds. I will have to do some more digging. On my current setup at home it usually works 10/10 times, but on this new setup it’s very hit and miss, and only works with certain Windows versions. Works to mount it manually, but won’t do it automatically. Tried with both IP and computer name (e.g. \\PXESERVER\). Thank you, I will try some more and come back if I have any information on the topic. AIO boott is really cool. I wanted to ask if the program Lmsify is open source or if you can publish it? I would really like to know how the program works? Sorry, I will not publish the source code at this time. I setup everything according to the tutorial, however I never get to the network path option. During my setup it seems to skip this step. I tried using the following; Legacy boot option, W7 Pro x64 and W10 x64 iso. Any suggestions on why it won’t show the network path option? Did you install Windows successfully? Sorry, Windows XP is not supported. Hello Tu Nguyen your tool is working very well! I want to make a question, is it possible to insert an autounattend.xml file into the AIO directory so that all Windows 10 ISOs can load this preconfigured file? Otherwise, you must insert the file into all ISO’s one by one. Sorry about my English. You can try to copy the autounattend.xml file to the directory containing the boot.wim file. /AIO/Files/WinSetup/XXXXXXX. It did not work, I tried to put the file in all directories that have bootmgr, it does not recognize, for now the only way and insert the file inside each iso. Upon entering Windows 7 Install, it will ask for the network path, username and password after everything is inputted. It will give me an error that says it can’t reach the network path. Other OS like 10, 8.1 is working fine. Yes, maybe Windows 7 does not support your network driver. Your tool is working great ! My Question is i want to set aio as PXE server and put them on auto start , write now its take manual steps as Open Application , click on Run PXE , select mode legacy and then check on BINL. You can create a batch file to run G:\AIO\Tools\PXE\pxesrv.exe. I got PXE server to load, however I cannot get passed the network path step. 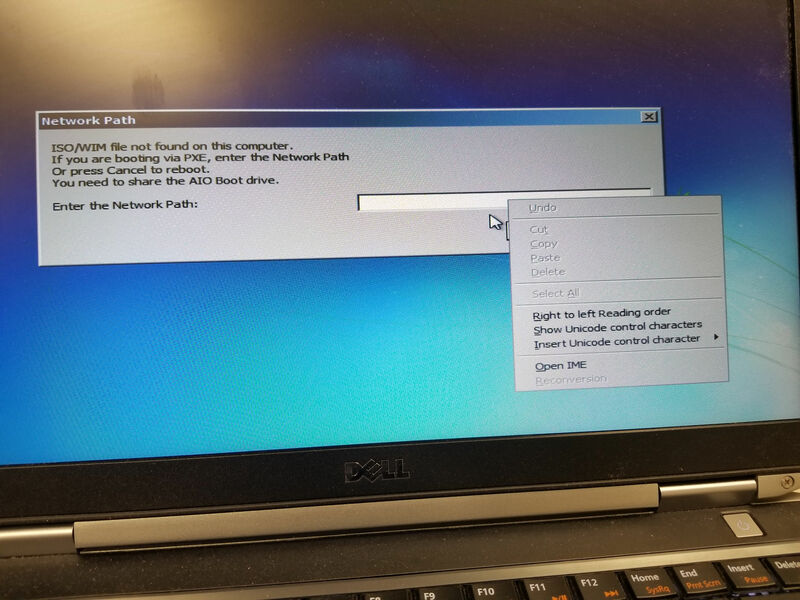 I get “network path is incorrect or does not exist” on the system I am trying to boot. However if I try the path on a seperate PC that is loaded with windows it finds the path just fine. 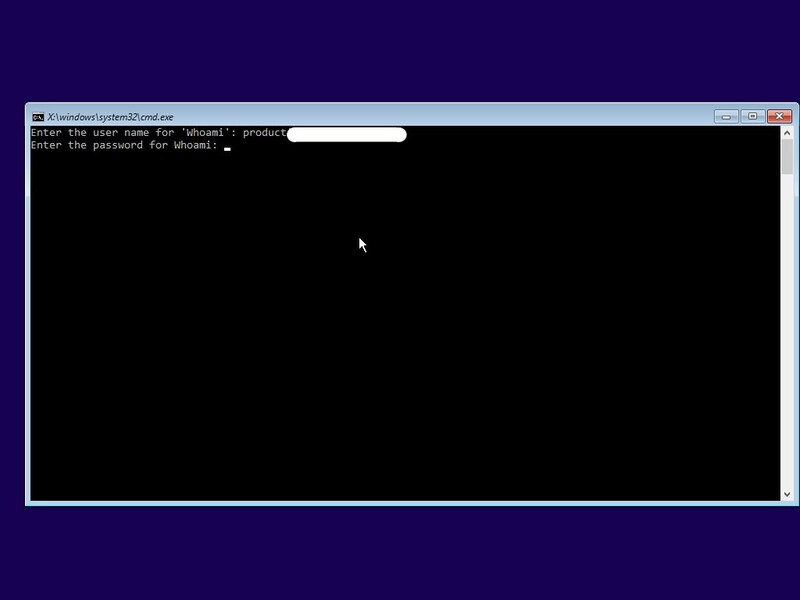 Press Shift + F10 to open Command Prompt, then use the net use command. I have not try yet. Does it work? I’m suspecting that your WinPE version does not have drivers for your network card. You can try this WinPE: https://www.aioboot.com/en/install-windows/. I was thinking this too, however now I am having issues accessing the shared folder through any computer. I suspect something is not working correctly with my shared folder now. DHCP-Server-IP: DHCP Server in Tiny PXE Server. I turned off the firewall and it works. Have the same issue above. I tried to run PXE tool to boot my second system from LAN and if I choose UEFI 64 in settings, I have an error message: PXE-E79: NBP is too big to fit in free base memory. If I choose legacy option the boot is successful. Any way around to boot in UEFI mode? Try changing the Boot file: snponly64.efi nor intel64.efi. Click Offline then click Online to restart Tiny PXE Server. could you please guide me or have some tutorial? Currently due to the lack of time I am not able to do the tutorial, but if you want to convert your router to the AIO server, first of all you need to ensure that the router does not run out of space for additional software. how can i run this on openwrt pxe? What do you see when you visit http://192.168.1.1? I’m not familiar with OpenWrt.